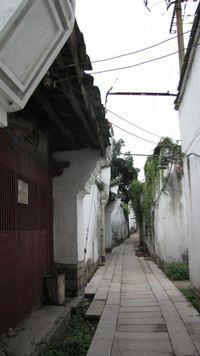 Fuzhou (福州; Fúzhōu) is the capital of Fujian Province in China. An older romanisation is "Foochow". Fuzhou is an old port city, Marco Polo visited it. In the 19th century, it exported more tea than any other Chinese port. Today, it is the provincial capital and administrative center, and also a major center for light industry. Nike has a factory there, and a Taiwanese firm that makes shoes for Adidas, Reebok and others has four. All are large factories, with several thousand employees each. Fuzhou is right across the straits from Taipei, and there is fairly heavy Taiwan investment. The city is on the Min River, a few km inland from the sea. There are many mountains and waterfalls in the hinterland, while sandy beaches are abundant in the coastal areas, especially in the town of Changle and the island of Pingtan. The actual port is in the suburb of Mawei, which has also been a center for shipbuilding for several hundred years. In 1884, the French destroyed a dockyard at Mawei, sinking a good part of the Chinese navy and killing hundreds. There is a museum to commemorate this. For a more general view of Fujian's seafaring history, visit the Maritime Museum in Quanzhou. The region also has its own culture and an architectural style distinct from other regions in China and Fujian, which can be found both in the city and in the towns and rural areas around it. 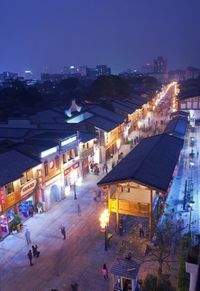 The city has the oldest wood structure in South China (Hualin Temple) and has one of the largest historic downtown districts in China "Three Lanes and Seven Alleys" with over 200 residences from the Ming and Qing dynasties. The Fuzhou region has its own language, called Fuzhou Hua (Fuzhou speech) or Mindong also called Eastern Min, where "min" is another name for Fujian. It is mutually unintelligible with Minnan spoken south of Fujian or any other Min Chinese varieties spoken in other parts of Fujian. Like everywhere in mainland China, Standard Mandarin is the official language and the lingua franca of the whole country, Standard Mandarin is used in education and public media, so most Fuzhou locals can speak Standard Mandarin. Fuzhou has a humid subtropical climate influenced by the East Asian Monsoon, with plenty of rainfall measuring 1.393mm on average. Extremes have ranged from -1.9°C (28.6°F) to 41.7°C (107.1°F). Winters are short, mild and dry (compared to the other seasons) and the average January temperature is 11.2°C (52.2°F). The average low is 8.2°C (46.8°F) and the average high is 15.2°C (59.4°F). Cold air masses originating in Siberia rarely arrive here, because they are blocked by the mountains in the north and west. Small portions of them however, may manage to penetrate through the mountains, causing night temperatures to fall below 5°C (41°F) in some cases. Frosts and snow are very rare, but there is a slight possibility of sleet occuring. On the other hand, when warm, moist air masses arrive from the South China Sea, daytime temperatures may surpass 20°C (68°F). Summers are very hot and humid. The hottest month is July, with 24-hour average temperature of 29.2°C (84.6°F). The heat during daytime is sweltering, because of the very high temperatures (the average high is 34.1°C or 93.4°F) and very high humidity (77% on average). Heat waves may occur and 40°C (104°F) readings are not uncommon. Keep in mind that during late summer and early autumn Fuzhou is in the path of hurricanes. Most of rain falls between February and September. Fuzhou has air links to most other major Chinese cities. The airport is an hour from town in the suburb of Changle, ¥25 by bus. You can get the bus at the Apollo Hotel. There are also complimentary shuttles to the Apollo Hotel from other places such as the Min Jiang Hotel. Shared taxis also go from there, at around ¥25. A private taxi would be around ¥200, likely more unless you haggle well. Direct overnight buses to/from Hong Kong, Shenzhen or Guangzhou exist, with sleeping bunks. ¥220-350, it is usually worth the extra for comfort. Buses from Xiamen are ¥70-90. A two hour ferry from Matsu (Taiwan via an overnight ferry from Keelung) costs $1300NT (see seat61 for details). Customs and immigration is at the ferry arrival center. It does seem there are any ATMs here but a 1 yuan bus will take you to the city (40-50 mins). A taxi driver will quote 80 yuan for the ride. The main Fuzhou train station is in the northeast of the city. You can reach it via #5 or #22 city busses, or it is cheap and quick by taxi from anywhere in central Fuzhou. There is also a new Fuzhou South station, located rather inconveniently. A taxi to it will be ¥50 or so from downtown and take about half an hour. The K2 bus runs between the two stations; the cheapest way to the South station if you have time is to go to the main station and take that bus from the parking lot off to your left as you face the station entrance. A new fast train between Xiamen and Fuzhou is available, leaving from the main Fuzhou station almost hourly, for under ¥100 one way. There is also a fast train from the South station to Shanghai via various towns in Northern Fujian, Wenzhou, Ningbo, and Hangzhou. Around 6 hours, ¥282 for second class, 330 for first. Taxis are, ¥10+ for short trips and under ¥30 for any trip in town. Taxi rates are ¥10 for the first 3km, and then ¥1.4 per km and one more after 11PM.Taxis are more available in the downtown area, and are often hard to get outside there. Street cameras prevent taxis from stopping in certain areas, so if you are having trouble flagging down a taxi, look for a blue taxi stand sign to stand under. If you speak Chinese you can order a taxi by calling 968968, a ¥3 charge in addition to the fuel charges should be added to the total. Note that taxi drivers in this town are pretty dishonest and will try taking long routes, charging you for "airport parking" and various other scams. Buses are often crowded, but run often and more-or-less everywhere for ¥1. Most are air conditioned. If the bus you require is packed just wait until the next one, or the one after, it should only take 5-10 minutes, being stuck on a dangerously overloaded bus with several dozen/hundred people sweating all over you is an experience best avoided, especially in the summer months. However, you should be aware that bus service stops at 10pm, so the last buses are often very crowded and sometimes you cannot get one. Taxis and enterprising drivers will offer group rides from crowded bus stops to other parts of town, usually for ¥15. Metro/Subway system is in the process of being built, with the aim of being finished in 2015. 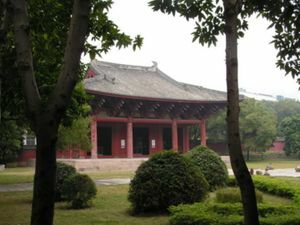 West Lake Park (西湖公园, Xihu Gongyuan), (Walk over a causeway to this park on an island in West Lake, located right in the middle of Fuzhou). Attractive urban lake in the center of Fuzhou. Rent paddle or electric boats and explore the lake. Walk over the arching footbridge to to the Fuzhou Science Museum, a small but nice museum featuring dinosaurs. Or, walk around the lake itself, it is surrounded by sidewalks and a boardwalk. edit As of spring, 2012 they also have Pandas in an enclosure where you can see them. Lin Zexu(林则徐, 1785—1850), Scholar and official, now considered a national hero for his strong opposition to opium trade. He was appointed as a commissioner to clean up the trade in Canton, where he seized and burned a large supply of opium. This provoked the First Opium War, which China immediately lost. Lin was blamed for some of this, despite his orders, and exiled to Xinjiang. Later, his reputation was restored. There is a statue of him in a small park in the Southeast of the city. Wu Qingyuan (吳清源, 1914—), Chinese Weiqi/Go player, considered by many players to be the greatest player of the game in the 20th century and one of the greatest of all time. He has lived in Japan most of his life and is generally known in the West by the Japanese name Go Seigen. There is a small park & museum dedicated to him on Wushan Lu. Restaurant zone in the cross between Gutian lu and Baiqi lu (behind Grand Ocean Mall) Near the pagoda you will find a place with a lot of restaurants in Fuzhou, with western and eastern food. Korean restaurant (in Ramada Hotel). One of the best Korean restaurants in city. BBQ in the table and good quality. Try the meat selection and the vegetables. More than ¥200/person. If you're craving some Western staples, places to check out are: Metro, Sam's Club, Walmart and Carrefour. Another good market to check out is right behind the Apollo Hotel, they have a lot of imported goods. Grandmart, a gourmet supermarket, under the Louis Vuitton, reopened in 2012 and has a selection of imported foods and products. Wanda Mall - there are now two Wanda malls. The first (Jinrong St.) has English movies and several recognizable brands names. The newest one (Cangshan - Pushang Ave.) has a Sephora, H&M, Zara, Abercrombie, a whole floor of restaurants, an IMAX 3D theatre (most films in Chinese only), Walmart and can easily have you feeling like you're in a mall in the United States. Clean, well layed-out, and Western toilets! Bao Long - huge shopping mall with roller-skating, bumper cars, and recognizable brands. A lot of shops don't allow you to purchase your items in their area, instead you have to go to the pay center with a receipt, pay, and then return to the store section with the new receipt before they will give you your product. Grand Shopping Center - Big designer names, like Louis Vuitton, are located in this luxury shopping center. Grand Mart, a gourmet supermarket, was under construction for the past year and recently reopened under a new name. The new gourmet supermarket is expensive but has an impressive selection of imported Western foods and products. JinTai Road boasts tons of cute boutiques and shops for reasonably priced items. Student Street - super cheap, great place to buy cheap purses, clothes and knickknacks. B&Q and HOBA - can serve all your home supply and furniture needs. Quite pricey (especially HOBA ¥1000+). Walmart, Metro, Tesco (Lifespace), Sam's Club - also have home appliances in addition to Western foods, such as mattresses, fans, heaters, ACs, microwaves, and toaster ovens. The bars in Fuzhou must close at 2am by law. However, there are a handful that remain open past 2am. Check closing times before going. The Party Bar, Tonghu Road (About 50 meters south of the main gate of West Lake Park). Has cheap beer, free pool table and live music. Popular with locals, sometimes quite crowded or noisy on weekends. Foreigners have stopped going since the tragic murder of Richard Gribble, a 23 year old Australian, by patrons of this bar. Bai Ma Lu Bar Street - There is a strip of bars on Bai Ma Lu - the Taxi drivers know it as Shao Yuan Yi Hao as the name for the entire area. After Hours Bars that are open past 2am. Keep in mind that after 2am in any city, Chinese or Western, most of the people out and about at that hour are inebriated and usually the dregs of society. Be aware of your environment, especially since Chinese will gladly join in a fight and gang up against foreigners without asking any questions. Even if you aren't doing anything wrong, you could find yourself in a bad predicament, so it's best to pay your bill and get out if you feel at all threatened or unsafe. There are a number of cheap hotels around the railway station. The area code for Fuzhou is 591. Westin Fuzhou Minjiang Hotel (福州万达威斯汀大酒店), (On the bank of Fuzhou Minjiang River).Phone: (86)(591) 88111111. 5 star international Brand Hotel in Fuzhou. The 5sense Restaurant has high level Chinese cuisine with imported seafood and meat and western touch.The musicians in lobby bar perform wonderful music in the evening. Mount Wuyi - scenic area famous for tea, ancient cliff burials and relics of the 3000 years old Minyue Culture. The landscapes here are surreally beautiful. Qinyun Mountain - a scenic mountain area about 65km from Fuzhou near the small town of Yongtai. Lots of great walks through river valleys with tons of sub tropical flora and fauna and those ubiquitous waterfalls. Worth an overnight visit. Langqi Island - a 45 min bus ride from Fuzhou, via Ma Wei. On the east of the island there is a splendid beach with few visitors. Cute old ferry takes you there from the mainland for ¥2. Tulou - round earthen houses built for multiple families and easy fortification when two main doors are closed. Southwestern part of Fu Jian Province. Many tourist buses leave out of Quan Zhou and/or Xiamen. This page was last edited on 19 September 2017, at 06:51.